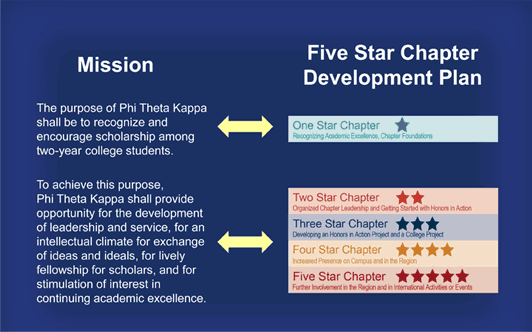 Phi Theta Kappa chapters have five levels of engagement that progress from local, campus involvement to regional involvement to international involvement. Using the Five Star Chapter Development Plan as a guide to success, chapters can enhance their working relationship with the college administration by becoming active on the campus and in the community. The chapter must fulfill all One Star Level requirements and the following Two Star Level requirements to reach the Two Star Level. Activities may be completed in any order. 1. Chapter advisor(s) and officers review the Five Star Chapter Plan requirements and set a Five Star goal. 4.Verify on the chapter directory that the college president, chapter administrator, and chapter advisor information is current, and report any changes. 5. Provide a structured orientation for new officers, advisors and committee chairs at the beginning of each academic term. 6. Chapter and/or chapter officers meet twice each month. 7. Chapter advisor(s) and chapter president each have the 2014/2015 Honors Program Guide. 8. At least two chapter members set research objectives and goals and conduct research for one theme of the Honors Program Guide, Frontiers and the Spirit of Exploration. 9. Chapter advisor(s) and officers meet with college president or other administrator to develop and discuss goals of the chapter. The chapter must fulfill all One Star, Two Star, and Three Star Level requirements to reach the Three Star Level. Activities may be completed in any order. Implement a College Project which is determined by the chapter and college president or other administrator. Chronicle chapter activities for historical purposes. Examples include keeping an Honors in Action journal, maintaining a notebook of chapter meeting minutes and/or newsletters, saving copies of Hallmark Awards entries, etc. The chapter must fulfill all One Star, Two Star, Three Star, and Four Star Level requirements to reach the Four Star Level. Activities may be completed in any order. Host a Phi Theta Kappa awareness event for your chapter on the college campus. Elements of your awareness event could include sharing benefits of membership like scholarship opportunities, Honors in Action,CollegeFish.org, and/or Competitive Edge. The chapter must fulfill all One Star, Two Star, Three Star, Four Star, and Five Star Level requirements to reach the Five Star Level. Chapter representative(s) participates in AT LEAST ONE of the following and is committed to sharing knowledge gained from participation with the chapter. Submit an entry in the 2015 Honors Case Study Challenge.